When one achieves something in life, throwing a party is a normal thing. When a judge is promoted to the Supreme Court, he or she, like any layman, would want to celebrate it. But an unusual celebration took place on Friday, 1st of July, at the Gregory’s Road residence of the newly appointed judge to the Supreme Court of Sri Lanka, Sathya Hettige. Why unusual? The guest list at Hettige’s party raised some eyebrows. President Mahinda Rajapakse, his brother Minister Basil Rajapakse, and the Prime Minister D.M. Jayarathne were all present. Justice Minister Rauff Hakeem was also there, but that is less noteworthy. It is normal practice at functions held to celebrate high judicial office that the Justice Minister is invited, and who is usually the only politician invited. It was Walter Jayawardana Q.C., Secretary to the Ministry of Constitutional Affairs under Dr. Colvin R De Silva in 1970s, who exposed how judges went homes drunk after parties. When he was explaining how the politicisation of judiciary started in post-colonial Sri Lanka, he said it was under then Justice Minister Felix Dias Bandaranaike who invited judges to political parties and offered drinks. It was only one method Felix used to politicise the judiciary. Now it is judges who are inviting politicians and giving them drinks. Justice Hettige started this new tradition of inviting politicians to parties in a context of where legal circles had been criticising him for his improper behaviour. He invited President Rajapakse to his daughter’s wedding, where the President signed as a witness and stayed more than one hour at the wedding ceremony. When Sarath Fonseka challenged his Courts Martial in the Court of Appeal, this matter came to light, and Fonseka’s counsel Romesh De Silva P.C., objected to Hettige sitting in the case, since President appointed the Courts Martial against Sarath Fonseka. But the objection was overruled and Sarath Fonseka’s writ applications were also rejected. Hettige has also been the subject of serious criticism over accepting ruling party nomination papers despite alleged procedural errors, and rejecting opposition nomination papers for local government elections. Justice Sathya Hettege must explain why he invited President Rajapakse to his daughter’s wedding to sign on behalf of their family, it being unlikely Rajapakse imposed himself as a witness. What is his relationship with the President? Is it appropriate that a Supreme Court judge should continue to have personal and social relations with the executive branch, especially of a government whose behaviour is extremely questionable from the viewpoint of democracy and the Rule of Law? I have raised serious issues affecting the integrity of the Sri Lankan judiciary. We raised the issue of the appointment of retired Chief Justice Asoka de Silva as Senior Legal Advisor to the President. We raised the serious conflict of interest issues relating to the present Chief Justice. Within the Asian region, the sixth Conference of Chief justices of Asia and the Pacific in Beijing in August 1995 adopted the statement of Principles on the Independence of the Judiciary. Sri Lanka was represented by the Supreme Court Judge P.R.P. Perera voluntarily agreed to the Principles on behalf of the then Chief Justice G.P.S. De Silva. There were editors who fought for the independent of judiciary. Ravaya Editor Victor Ivan, Sunday times editor Sinha Rathnathunga, then Deputy editor now Lakbima News editor Rajpal abenayake and late Lasantha Wikcramtunge. Sadly, since Rajapakse came to power, we can’t see any of these acts of misconduct discussed in the Sri Lankan media. The editors who fought for the independence of the judiciary are sleeping, or converted to the Mahinda Chinthana or they can’t write because of media suppression. But sad thing is these editors says there is no media suppression in Sri Lanka or not fighting against media suppression. How did these journalist and activists who stood for democracy get into this blind alley? 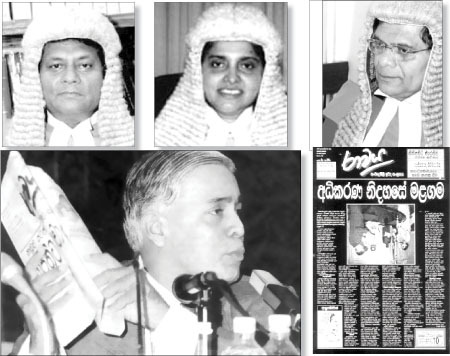 Especially Victor Ivan the one who wrote hundreds of article about the issue and he later published a book call “ An unfinished Struggle” when Sarath Silva appointed as CJ Ravaya printed a black front page with oath ceromeny picture up side dawn. When Shirani Bandaranayaka was to appoint to supreme court Ravaya attacked her appointment week after week. Headline after headline. When Victor Ivan and Ravaya exposed corruption in judiciary he was criticized by some others saying he had personal problems with Sarath N Silva and Chandrika Kumaratunge. He is proving that allegation now only criticizing former Chief justice. Thanks CT for valuable article. I only wish if you could publish a book on how MR built bridges with judiciary and SC judges and how he used them for his benefits and dumped them whenever he desired. Thank you.